Hex and the city : grow your owm ! Temper the chocolate and cocoa butter together and line the moulds very thinly. Chill to allow the chocolate to crystallise. Demould and reserve for assembly. Whisk together the room temperature egg whites, egg white powder and sugar for 8-10 minutes till a soft meringue is formed. Sieve the almonds mixed with ground ginger powder. Melt the chocolate to 60° C.
Fold the almond mix into the meringue, followed by the melted chocolate. Spread the dacquoise over a silpat mat to a depth of 4mm. Spray lightly with water and bake at 160° C for 6-8 minutes. When cold cut out a rectangle of 18 cm x 18 cm and place in a frame 4 mm high. Mix together the sugars and pectin. Puree the fresh raspberries and sieve to achieve 70 g. Cube the other fresh raspberries. Heat together the puree, cubed raspberries and lime juice to 40° C.
Add the sugar/pectin mix to the fruit mix and stirring continuously heat to 80° C.
Pour into a shallow container and allow to cool to 50° C, then add the rose water and lime zest. Place a 6 mm frame on top of the sponge frame and pour the compote into the frame. Melt the coconut fat to 20° C. Mix all the ingredients together with the paddle attachment. Using a drum sieve with a 8 mm grid, push the crumble through the holes using a scrape card onto a lined baking tray. Ensure there is an even layer. Bake in a convection oven at 140° C for 18-20 minutes until crunchy. Take the cold crumble and coarsely chop with a knife. Place through the drum sieve separating out the larger pieces from the crumbs. Crush the crumbs finely and reserve. Melt the chocolate to 45° C and mix together with the pine nut paste. Add in the crumble pieces, chopped chocolate and freeze-dried raspberry. Mix well and scatter over a lined tray. Set in the fridge. Reserve in a sealed container. Melt the chocolate and sunflower oil together and blend with the lecithin. Melt the gelatine mass to 45° C and blend with the water at 25° C. Now emulsify this, using a hand blender, with the melted chocolate mixture, little by little. Cool to 28° C.
Whisk the egg whites on a medium speed for 3 to 4 minutes, then add the chicory root fibre powder and whisk for another 4 minutes to obtain a meringue. Using a whisk, gently fold in the chocolate water ganache to create the chocolate mousse. Weigh all the ingredients into a jug and blend together with a stick blender until smooth. Pour into a ½ liter siphon and give 2 gas charges, shaking well between. Pierce a hole in the bottom of a paper cup and ½ fill the cup with the mixture. Microwave cook on full power for 30 to 40 seconds until cooked. Place upside down on a rack to cool. Once cool wrap to stop it drying out and reserve for assembly. Puree the raspberries and sieve. Scale 185 gr of puree and add the water and the rose water. Mix the powders and sugars together and add to the liquid mix. Whisk on a machine for 4 to 5 minutes until a stiff meringue is formed. Using a rose tube, pipe small rose shapes on a silicone sheet and dry in the dehumidifier at 50° C for a few hours until crispy. Place some crunchy into the bottom of each window box. Pipe 10 grams of chocolate mousse on top of the cruncy. Cut rectangles of the compote/sponge insert and place on top of the chocolate mousse. Top up the window boxes with the mousse until full. Allow to set in the fridge. To serve – sieve a thin layer of the crumble crumbs over the top of each window box. 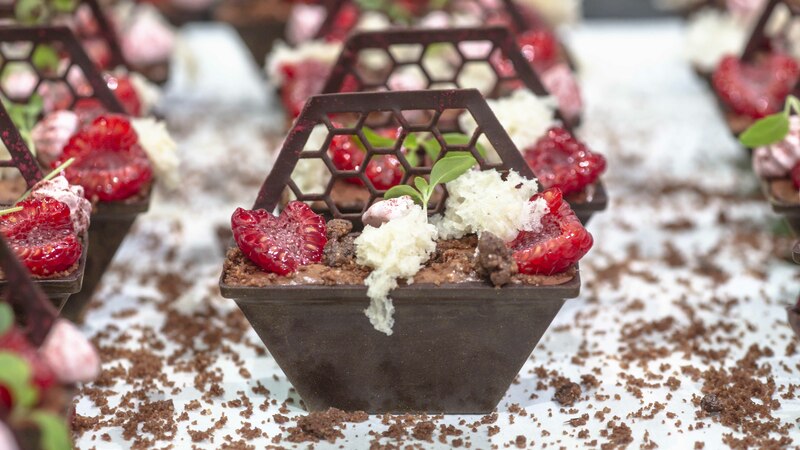 Decorate each window box with the chunks of crunchy, fresh raspberries, sponge, honey cress, rose meringues and the chocolate lattice.